The 14.85cm Fold N Lock Invitation Card is a unique but popular card for creating beautiful wedding invitations with a difference. The short flap is folded & glued in the middle only - allowing the edge to be lifted slightly. The larger flap folds over and extends approx. 2mm past the small flap - a slight bend and it will fit underneath the edge of the short flap - locking it closed - hence it's name "Fold N Lock". Another slight bend or lift and the card easily opens again. The front flaps are easily decorated with decorative handmade papers for a truly stunning appearance. This14.85cm Fold N Lock Invitation Card is made from our beautiful premium metallic light silver 300gsm card stock from Italy (similar to Curious Metallics Lustre but a little more neutral in colour) and is double sided in colour. 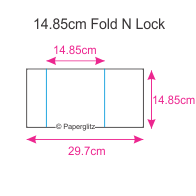 This 14.85cm Fold N Lock Invitation Card is made from paper that is manufactured in Italy and is converted and packaged by Paperglitz in Sydney, Australia. Crystal Perle™ is specially imported by Paperglitz and has quickly become one of Australia's favourite metallic paper ranges. It is very popular for wedding invitations as it is a premium quality paper with fantastic batch & colour consistency and is affordably priced. Buy with confidence and specify only "Genuine Paperglitz 14.85cm Fold N Lock Invitation Cards" for your next project.